I will be posing for Dr. Sketchy's Anti Art School on March 4th. Hosted by my friend Miss Molly Crabapple, it's a fun live drawing session with contests, drinks and free chocolates! If your tired of the usual stuffy studio sessions, this is the place to draw burlesque dancers, circus performers, athletic yogis and now me! Went to see "Bodies, The Exhibition" at the South Street Seaport. It was interesting to see all these people clustered around the beautifully preserved parts of so many human bodies. Everyone was marveling at the ligaments, tendons, arteries, bones and then looking down upon their own breathing machinery. I overheard an earnest young man say, "I should take better care of my cerebellum." I was curious to see how he intended to do that. This came from a dream: I was in a moonlit garden and spiders descended down from the sky. 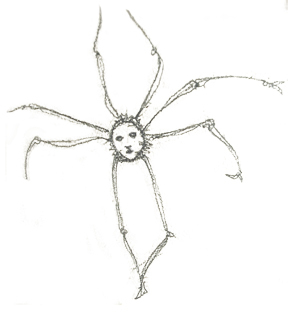 They were really faces with spindly legs and I don't remember anything after that. But the image stayed with me.